Hi Im back for a quick visit :-) busy busy girl. 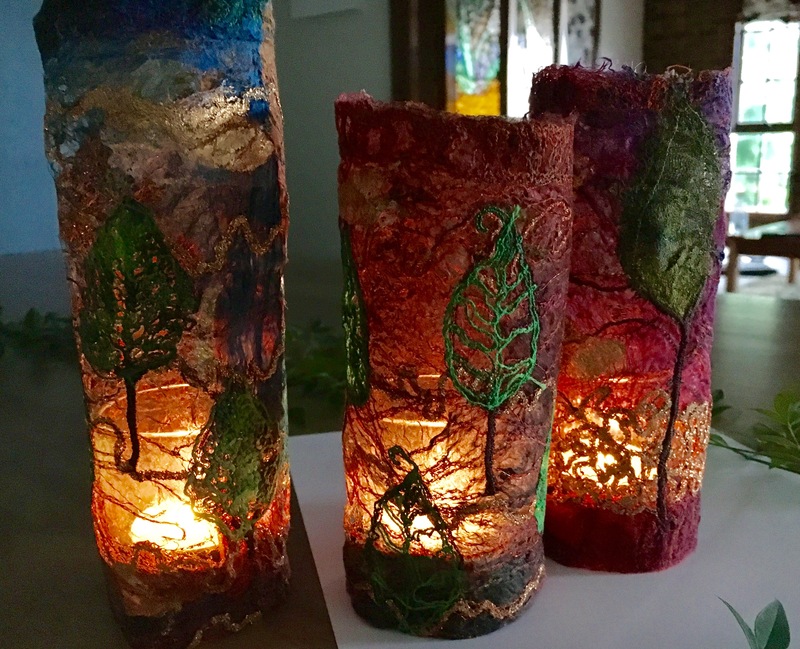 I have just had a little play with some t-light covers created using silk fibre hankies in delicious colours and lustrous textures. PLEASE REMEMBER TO USE BATTERY OPERATED T-LIGHTS !!!!!!! Machine embroidery threads my preference is rayon for its lustre but use whatever you have or prefer. Thicker hand embroidery thread or such for bobbin work. Gold thicker thread for bobbin or free motion couching work. Free motion closed toe embroidery foot. Optional free motion couching foot. Bobbin to tension for thicker thread. Size is really up to you, find a cylindrical vessel you like the size and shape of and that you know will fit a battery operated t-light to guide you for size. 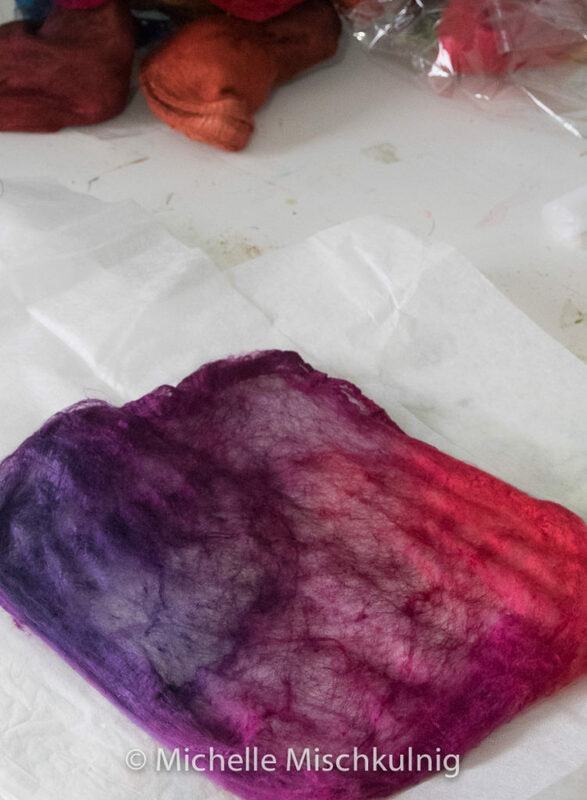 To start peel a very fine layer of silk hankies so fine it is like a cobweb see image below and lay it on top of a piece of vilene to fit. Place a second piece of vilene over the top and pin. Stitch the water soluble vilene sandwich with a straight stitch setting, in a landscape direction ( actually totally up to you which direction and stitch you use :-) ) Use a second colour or variegated thread and straight stitch again landscape direction making sure your stitch lines intersect at different points. 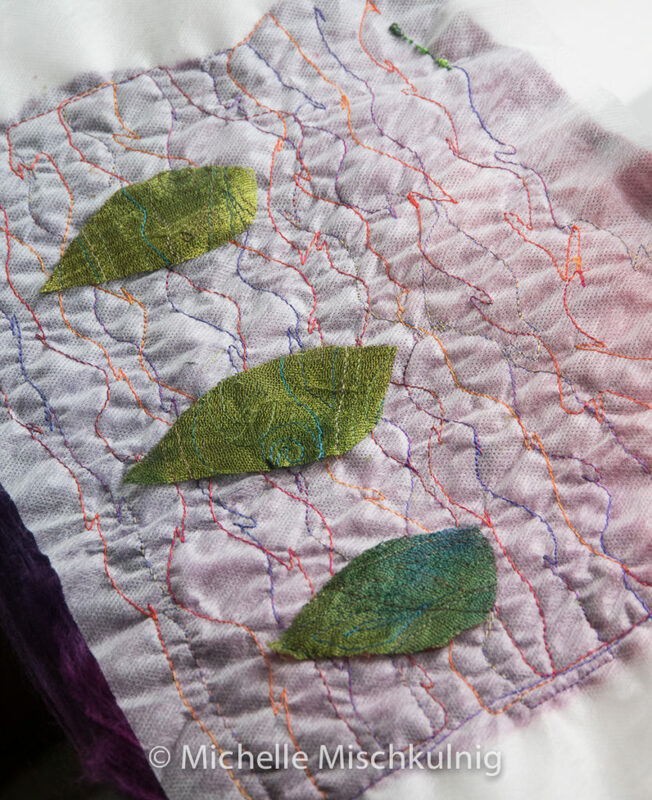 Cut some very sheer green fabric into tree foliage shape the shape is of course up to your imagination. 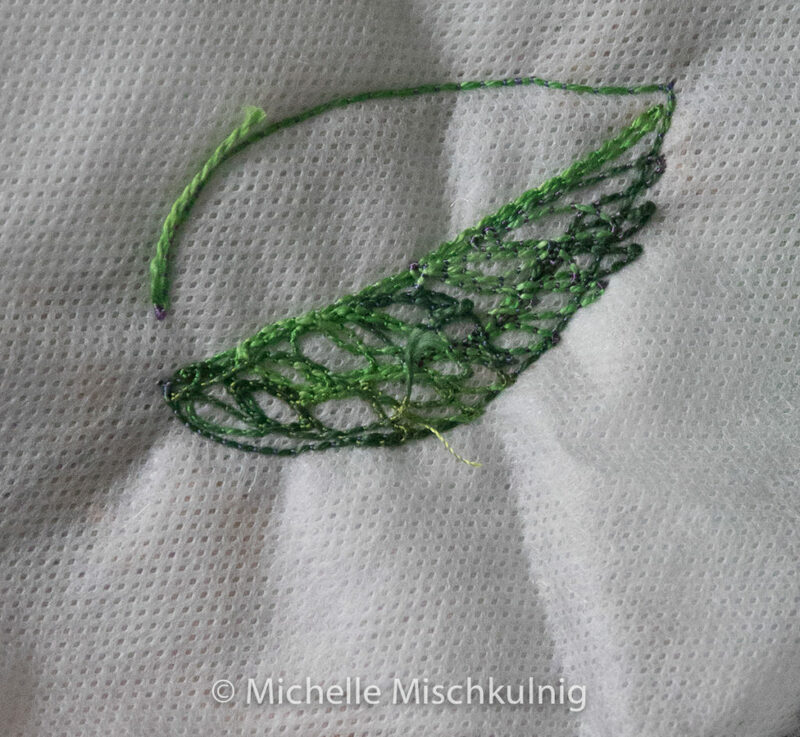 Stitch this shape into place first going around outside edge and then again on the inside of the first stitch line. 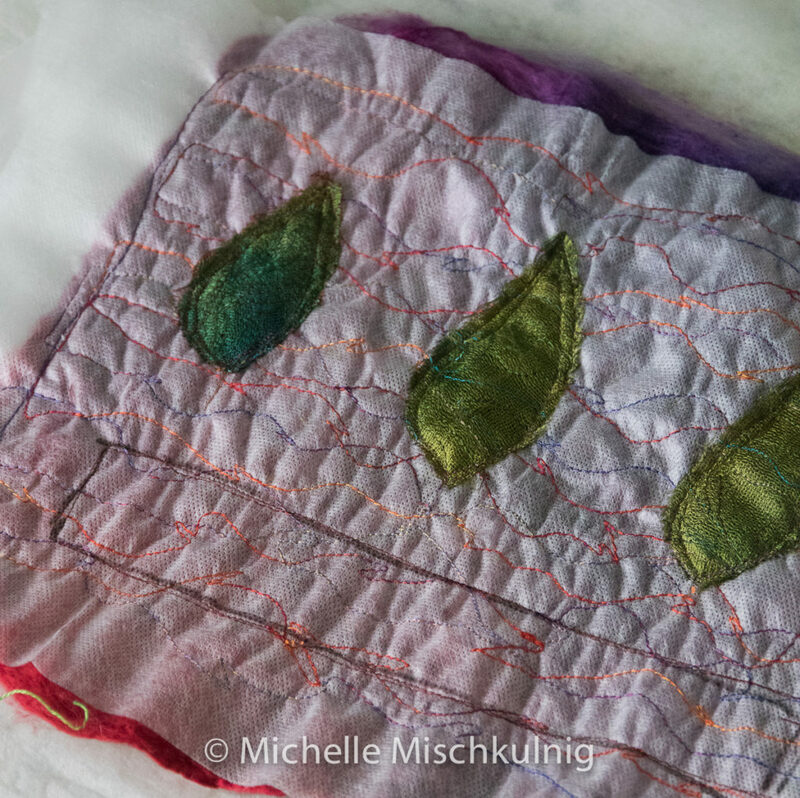 Draw a rectangular shape along the bottom edge which finishes inside the outer edges of the vilene.Stitch around this shape a couple of times and then cut it out. 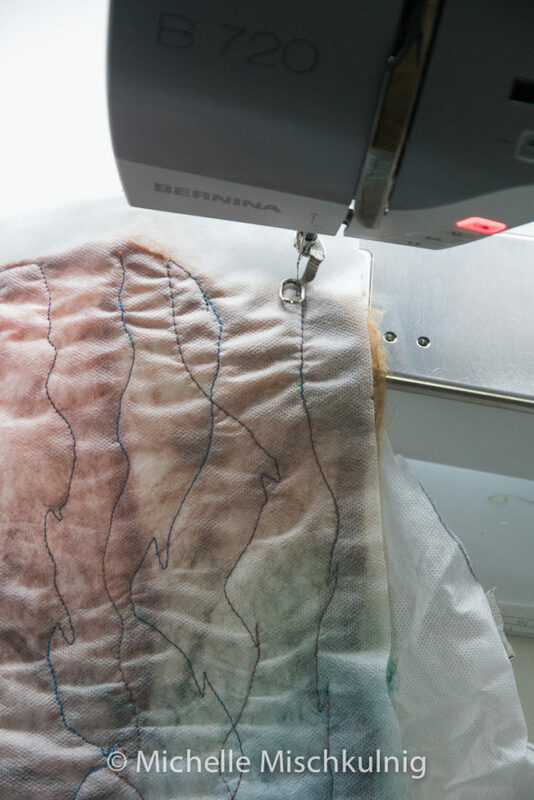 Place a double piece if vilene behind this cut out area and pin to secure in place.Using a gold chord or similar free motion couch or alternatively fill your bobbin with the thicker thread and work upside down. 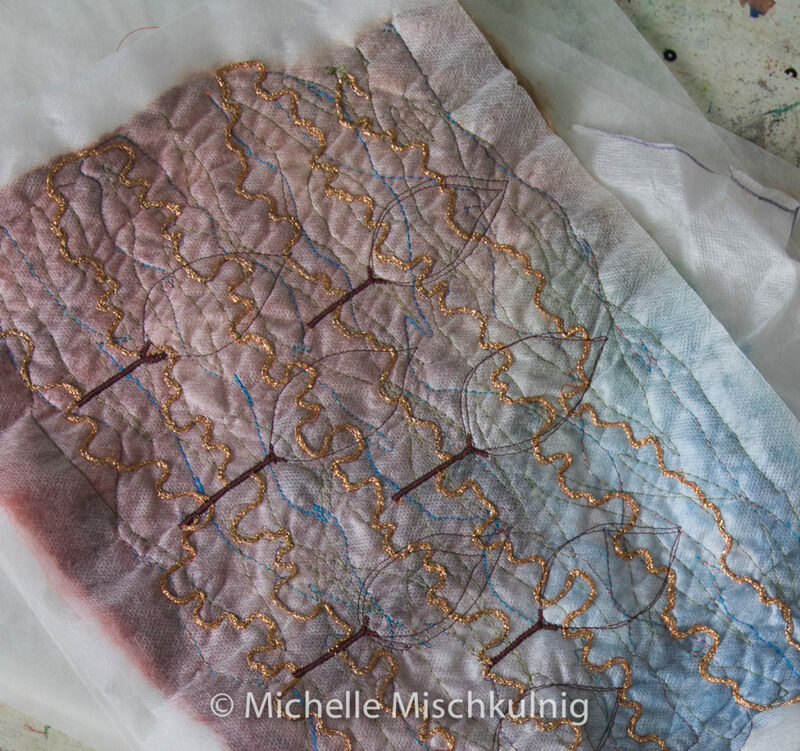 If you are not sure about either of these methods it will be just as beautiful to fill in with normal machine embroidery thread but make sure all your stitches interconnect.Finish each long edges the entire fabric piece with some stitching. 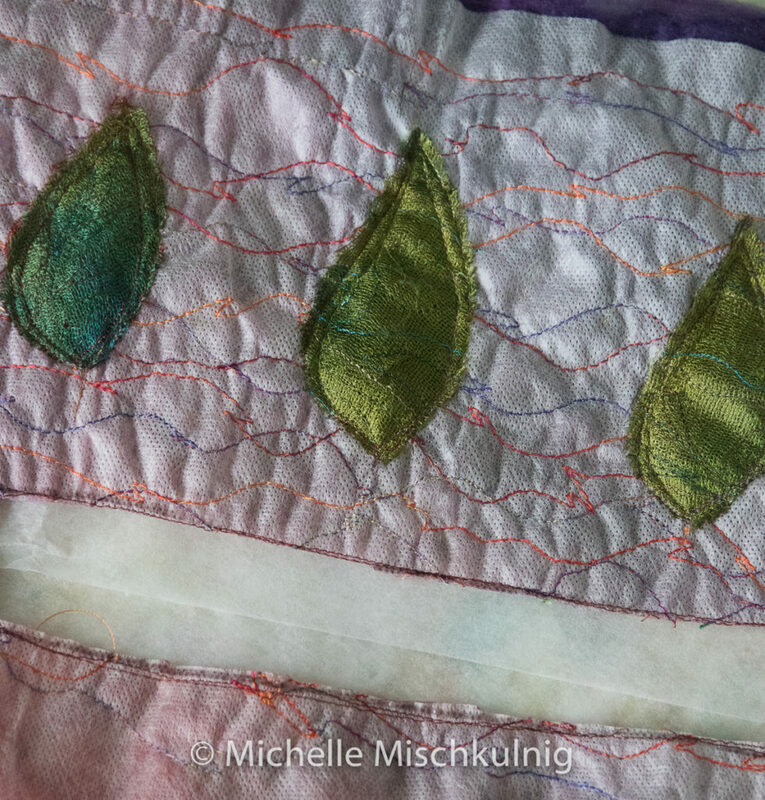 Turn to the back of your fabric and cut out the backing of the foliage so as the light shines through the foliage. 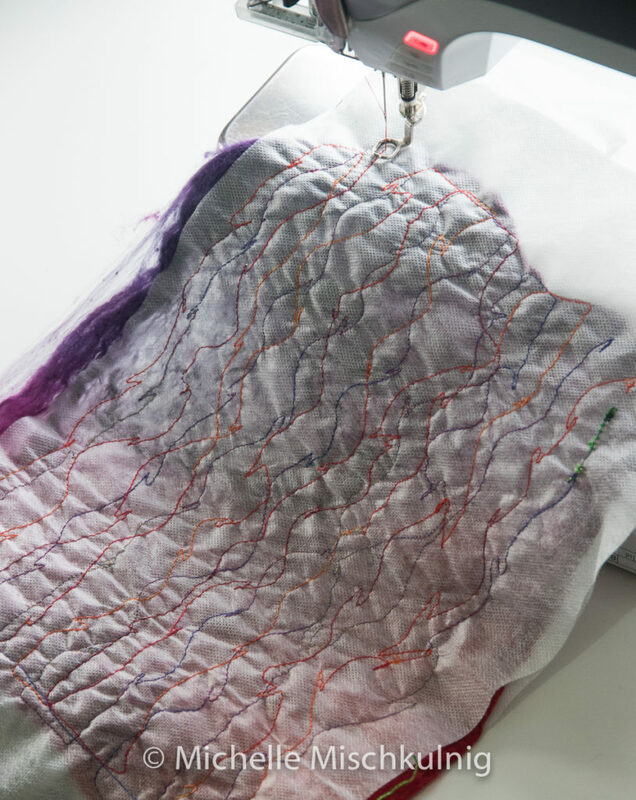 When you have completed your stitching rinse the fabric out in warm water you don’t need detergent as it is fine to leave it a little sticky it helps to stiffen the fabric. 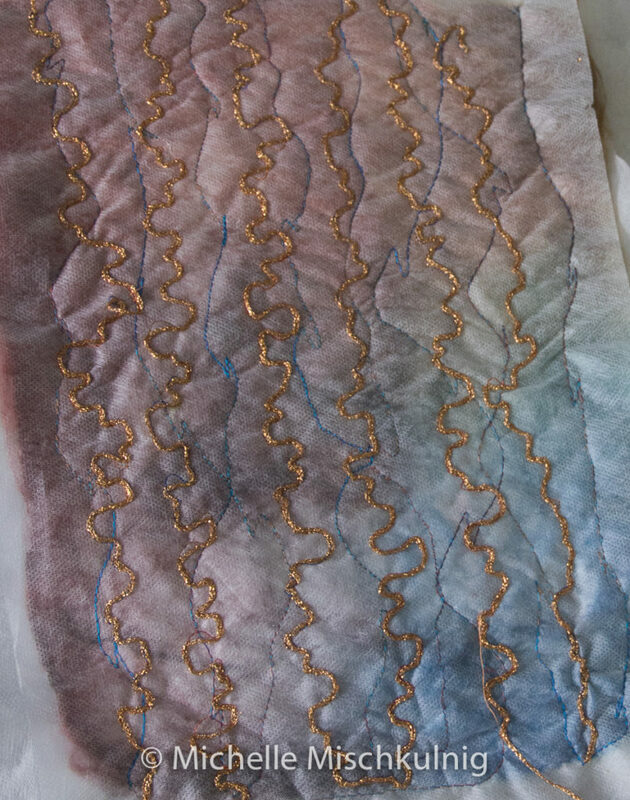 Now the fabric is dry add some gold high lights using gold foil and fusible web. 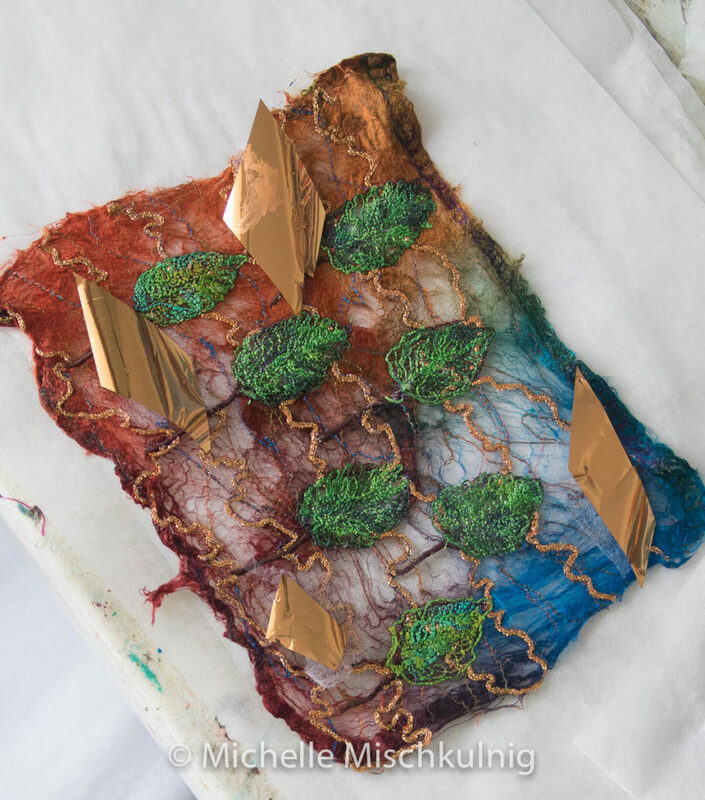 To do this place some small pieces of fusible web on the top surface of your fabric and some gold foil on the top of the web. Iron over the foil area carefully with gold side up and a hot iron this will melt the foil to the fusible web, then gently remove plastic coating on the foil, leaving gold leaf apperance. 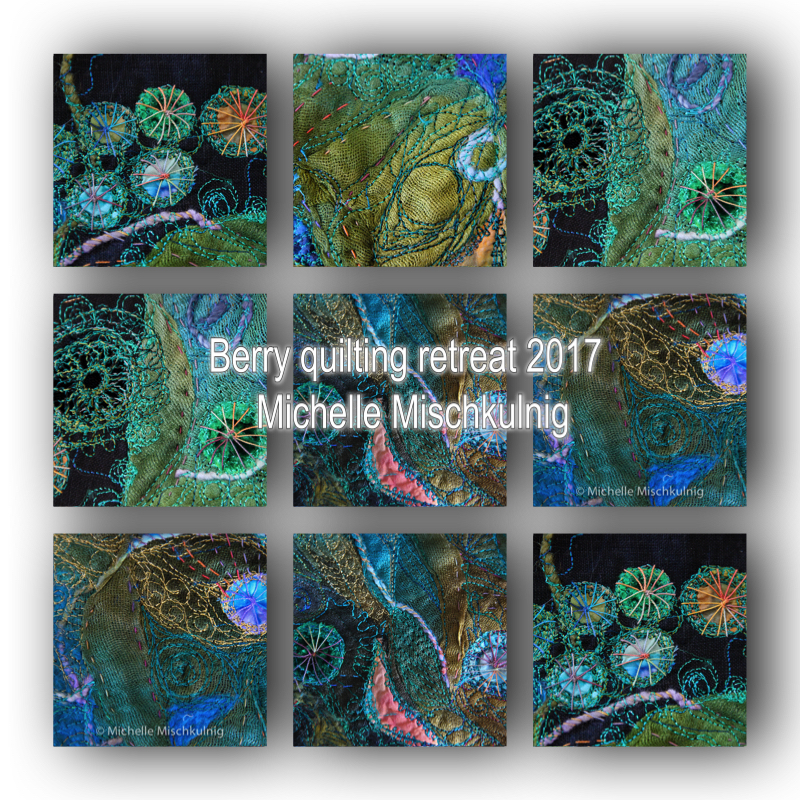 If you are unsure about this process there is plenty on youtube that can help you. 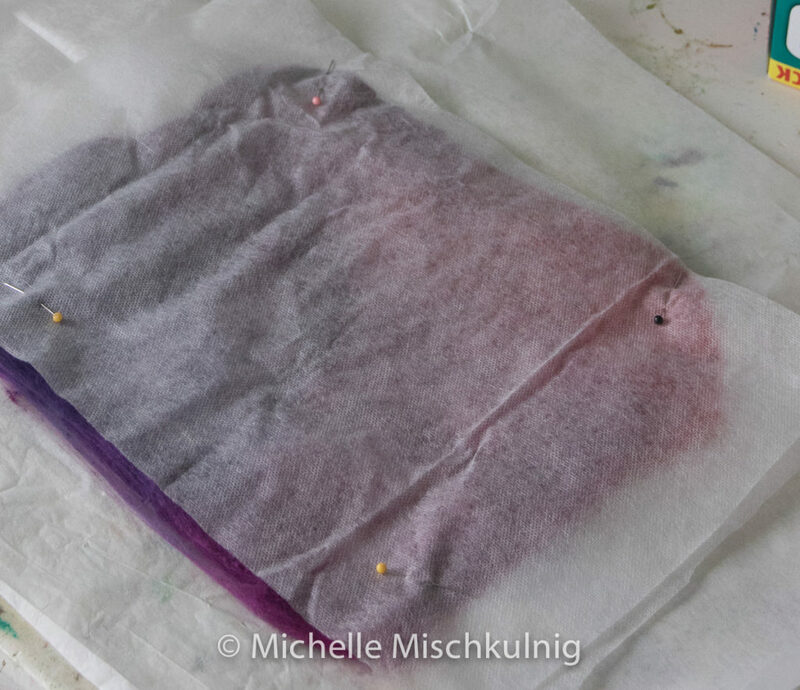 Now the foil is fused to the fabric place a piece of protective baking paper over fabric and give it quick iron on hot setting to press into shape. 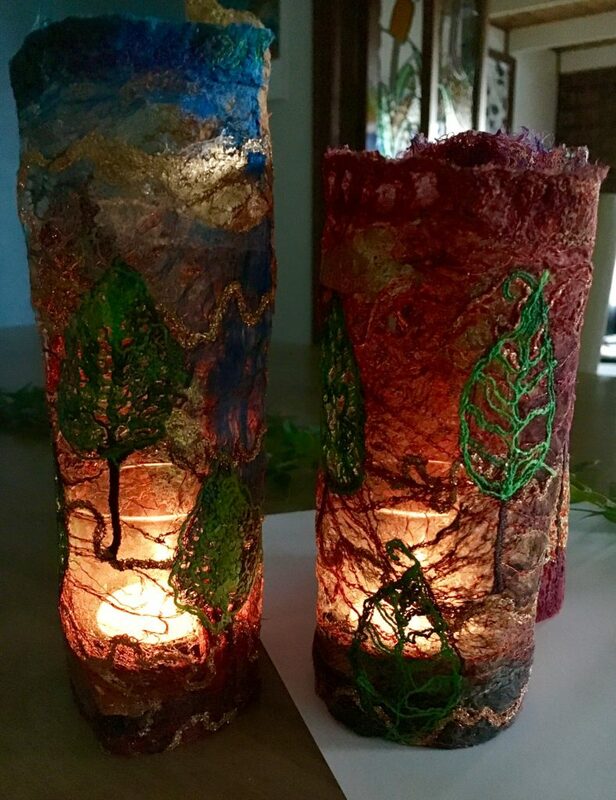 Then paint the whole surface with watered down PVA glue about 50/50 water glue to stiffen the fibres leave this to dry and then shape your fabric into a cylindrical shape that will fit over a battery powered t-light, hand stitch the edges together to hold the shape. 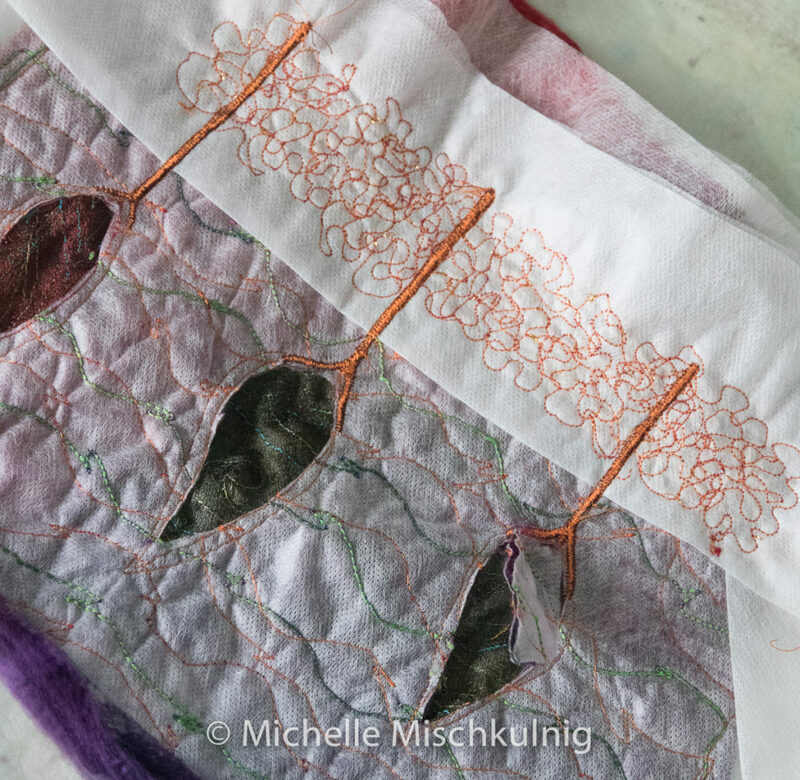 Once again create a fine silk hankie sandwich with the vilene as per instructions for number one and then stitch your first layer landscape and straight stitch. 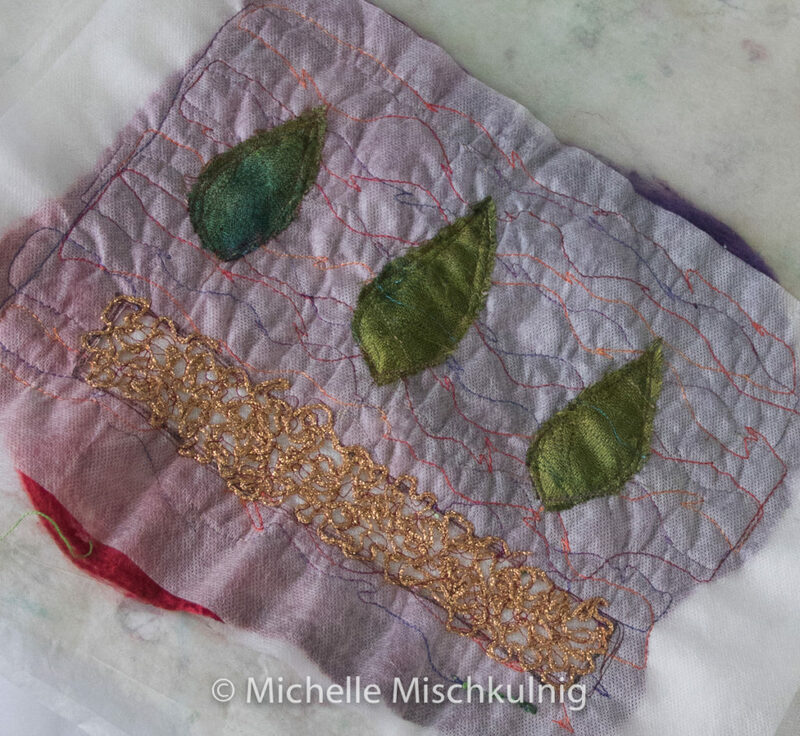 For the second row of stitching I have used a free motion couching foot and the same golf chord as for number one. 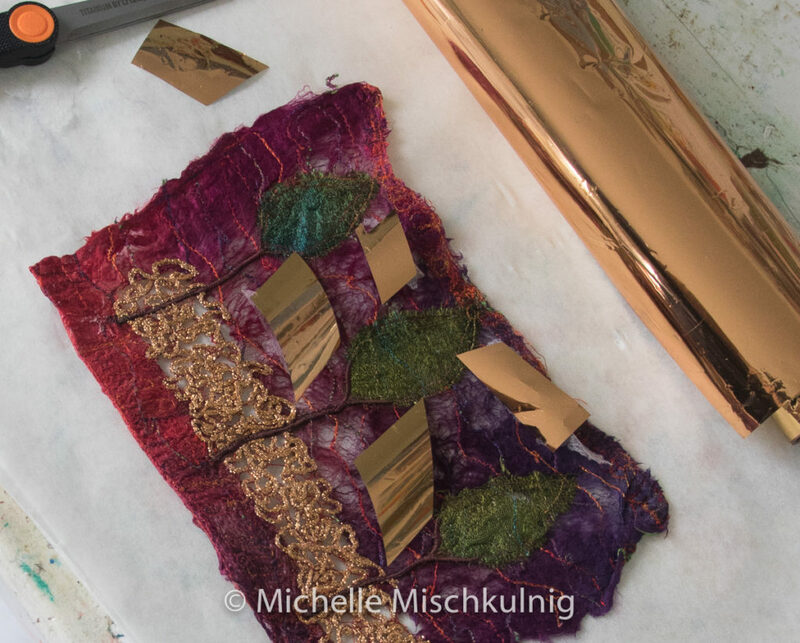 You can use the thicker gold thread in your bobbin or just use any metallic machine embroidery thread. 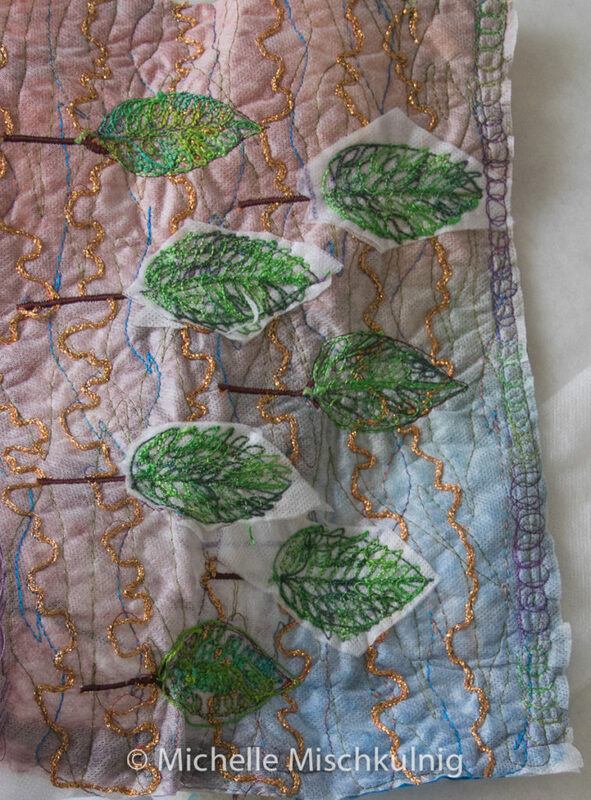 Now its time to snip away cut out the inside shape of the foliage stitch line.I chose not to cut out all of the tree foliage shapes as you can see below . 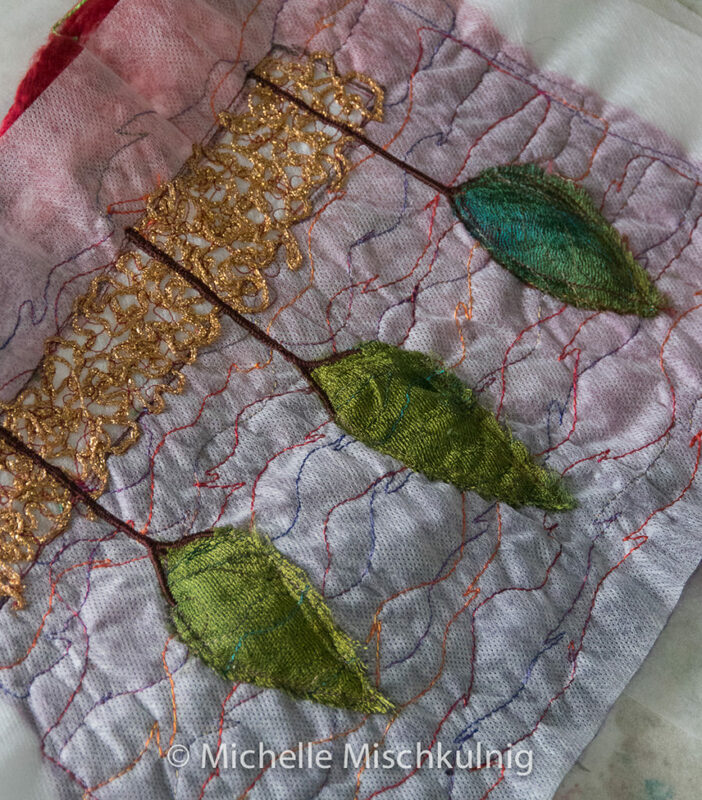 Fill your bobbin with a thicker thread, I have used a hand embroidery thread which is too thick to run through the needle. 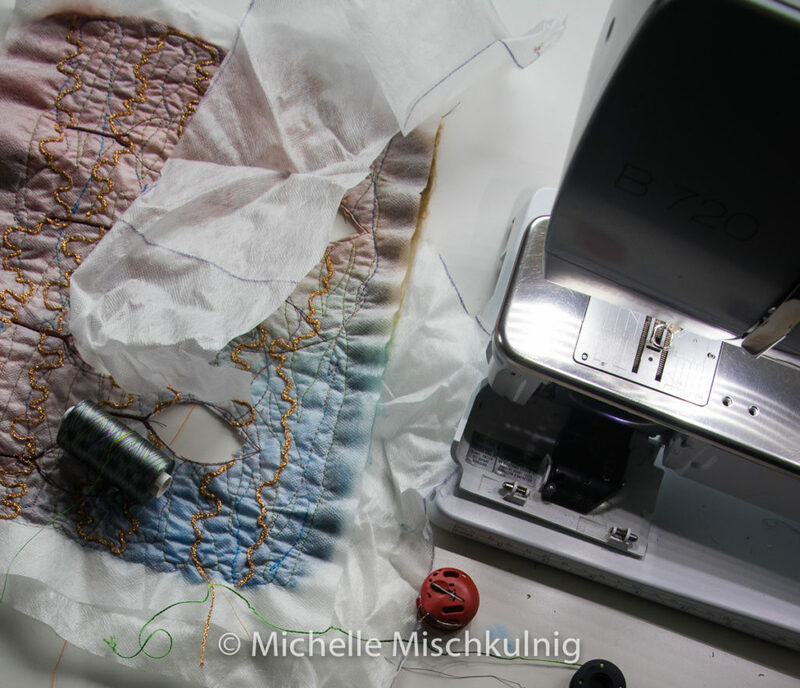 The bobbin stitch thread will be showing on the front so its time to work from the back. 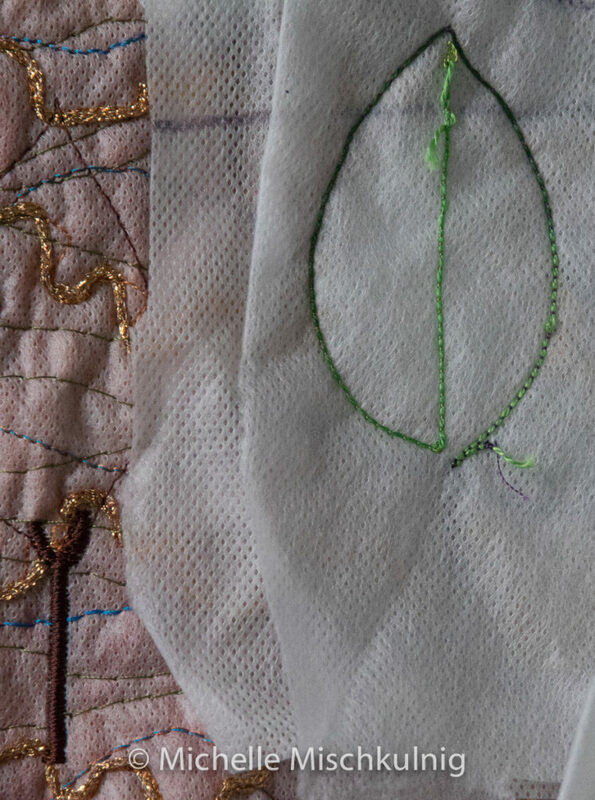 To fill in the cut out areas with stitch place double layer of water soluble vilene under the front side of the cut out area pin in place and then stitch from the back of the fabric catching in the edges of the cut out area . 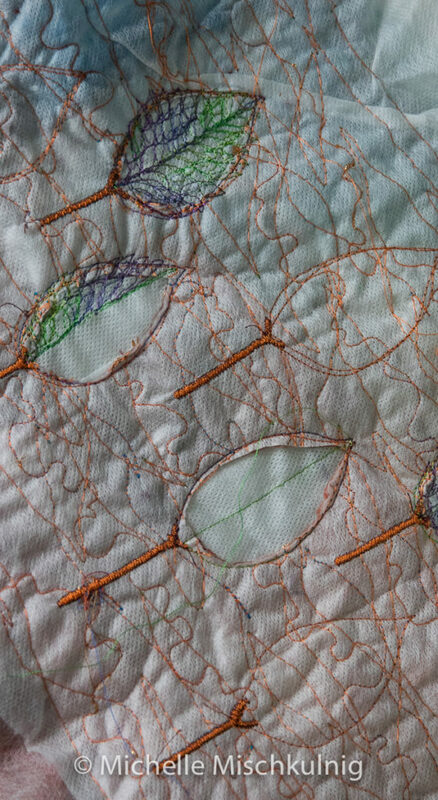 I have also work into the leaf foliage area that wasnt cut out. 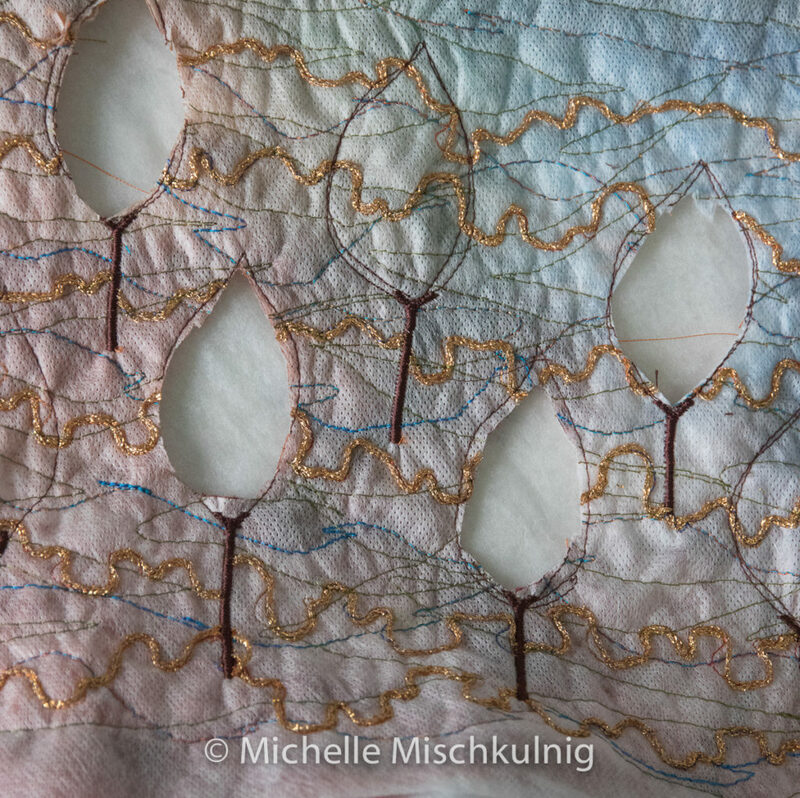 The idea of the cut out area is for the t-light to shine through.I finished the long edges with some stitching . 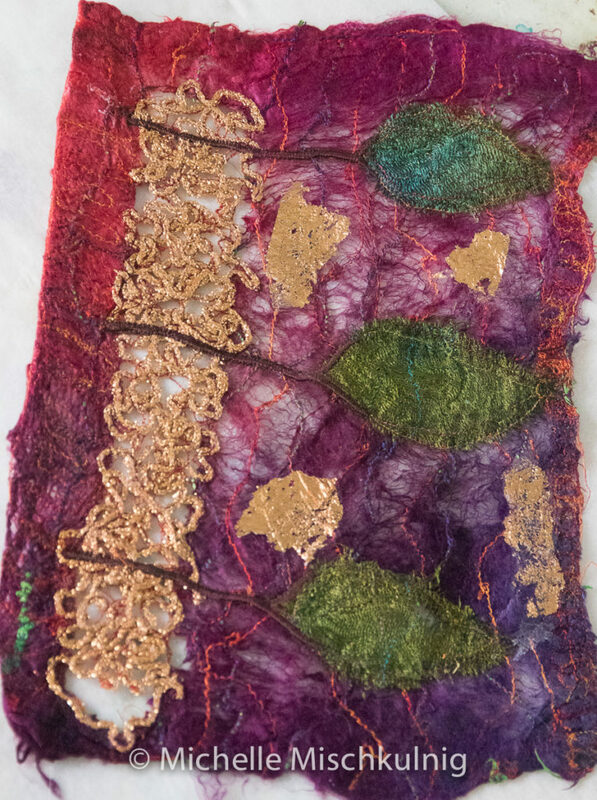 Wash out your embroidered fabric in warm water and leave to dry when dry repeat the gold foil step from number one if you wish too. Then use the PVA glue 50/50 with water to stiffen it, when dry iron and form into a cylindrical shape and hand stitch the edges together.